We’d love more squash and zucchini. and we could use more tomatoes. What we don’t need any more of is cucumbers. And that’s an interesting statement, given that more than half Amanda’s cucumbers died early in the season, victims (we think) of voles. The ones that survived more than made up for it, though, and right now we’re covered in cucumbers. 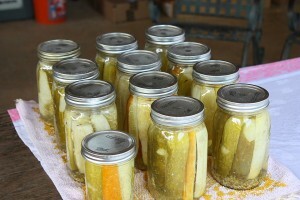 We have them at every meal, and yesterday Amanda cut up a big batch of them for pickles. Today’s program is shorter than usual because we’re trying to help Amanda’s voice recover from a debilitating case of laryngitis, but there’s time for us to tell you about the pickle-making and to talk about the next big canning task we think we will face. 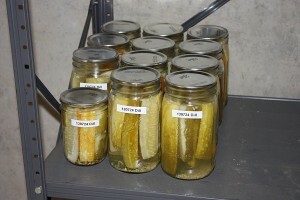 Here are our pickles fresh from the canner with the bands still attached. And now they’ve taken their place in the root cellar. The bands are no longer necessary, and we’ve removed them so they won’t rust. 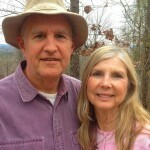 Next Next post: Podcast #196 – A Day in the Life . . .